Obituary for Frances M. (Ursic) Shink | Joseph W. Nickels Funeral Home, Inc.
Frances M. Shink, 95, of West Newton (Sewickley Township), passed away peacefully Sunday, Aug. 26, 2018. She was born May 29, 1923, in Smithton, the daughter of the late John and Frances Ursic. She was a lifelong member of St. Edward Roman Catholic Church (The Sunshine Club and RCIC) and the S.N.P.J. in Herminie. Fran was the credit manager at Joseph Horne Co. in the Greengate Mall for many years. After earning her bachelor of science degree from California University of Pennsylvania, she worked for 20 years for the PA Department of Labor, Office of Employment Services as an interviewer/counselor. After retiring, she joined the Westmoreland County Children's Bureau as a social services aide. In this capacity, she provided services to children and families for 20 years before her retirement again in 2014 at 91. In addition, Fran was a dedicated and enthusiastic community volunteer. As a young woman, she was determined to start a Girl Scout troop in her small town to benefit the young girls there. After seeking advice and following the procedures, which required a minimum of 30 girls to sign up, she placed an ad in the paper and was astounded when more than 90 girls appeared. She coordinated the beginning of three troops that served the community for many years. 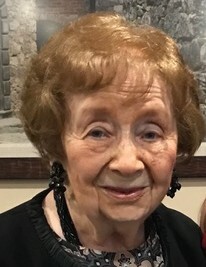 Fran volunteered as a classroom aide in both the public elementary school and the Catholic school where she was a welcome sight for both the children and the teachers. An excellent cook and baker, she shared food and recipes with relatives and friends. As a friend, she was always there with whatever she could provide. Whether driving across the country to sit at a hospital bedside, babysitting, cleaning or cooking, she was there. As a church volunteer, she contributed many years of time and service. Fran was an avid sports fan and a faithful follower of the Pirates and Steelers. A longtime member of the Friendship Club in Monroeville, she enjoyed the lunches, entertainment, and friendship of many. As part of the Second-Time-Around Club, she enjoyed dancing and traveling with longtime friends. She loved playing cards and board games, reading and antiquing. Her husband, John, with whom she shared her life for 59 years; her sister, Mary Ursic Smith; her brother, John Ursic; son-in-law, Bob Otto; and her nephews, Rick Smith and John Faltin preceded her in death. Surviving are her loving children, Linda, Shari and Gary Shink; her daughters-in-law, Leslie Nettelmann and Denise Shink; her cherished grandson, Jon Michael and his fiancee, Iyana and her daughter Sanai; her nephews, their spouses, children and grandchildren; and her many friends. Friends will be received from 2 to 4 and 6 to 8 p.m. Friday at the JOSEPH W. NICKELS FUNERAL HOME in Herminie. A funeral Mass will be celebrated at 10:30 a.m. Saturday in Holy Family Catholic Church in West Newton. Burial will take place at West Newton Cemetery. Memorial contributions may be sent to Shari F. Shink, Founder and President Emeritus, Rocky Mountain Children's Law Center, 7360 W. 28th Ave., Wheat Ridge, CO 80033, to continue her extraordinary work on behalf of abused and neglected children. To send online condolences, please visit www.nickelsfuneralhomeinc.com.